France’s Response to Terrorism: Start Teaching Arabic in Middle School! In the last 19 months, France has been the stage for three major terrorist attacks. The Charlie Hebdo/Kosher Market in January 2015, the Bataclan in November 2015 and now the Bastille Day rampage on July 14, 2016. More than 230 innocent people lost their lives at the hands of bloody murderers who all appear to have Islamic connections and/or ISIS affiliations or sympathies. I mourn for France and with France, remembering the families of all the victims. I also remember French Prime Minister Manuel Valls’ speech days after the three January attacks. It was passionate, firm and gave hope to the French people. It was exactly the sort of leadership that was needed at the time. Then came the November attacks around Paris. France was in shock for the second time and it appeared as if all that had been put in place or at least discussed, amounted to nothing. France started to lose hope and extreme-right populist party, Front National, became more vocal about their concern for the country. President Hollande and Manuel Valls’ popularity started to plummet. Not much had been done except placing a few police officers here and a another few soldiers there. The French were no longer feeling safe and rightfully so! One of the responses to ISIS massacres on French soil was to bomb some of their strategic facilities, something that I agree needed and continues to need to be done. France’s response to ISIS outside of French territory has been bold and somewhat successful on the ground in the Middle East. ISIS has been affected, so they decided to change their approach to terror. Same drive: Islamism, same method: bloody terror but different expressions of that terror. We could call it “disposable terror.” Use it once for maximum damage and then dispose of it and prepare for your next attack using another completely unexpected approach. It is working and the world appears to be overwhelmed by terrorism, not knowing what’s coming next or how to respond, let alone prepare for it. Just days ago, Manuel Valls declared that France had to “learn to live with terrorism.” This and his lack of a clear plan to protect France caused him to be booed at a gathering in Nice to honor the July 14th victims. His statement is NOT appropriate unless France chooses to become a dhimmi state. France is obviously a favorite target for ISIS and its cohorts. Reasons can be given for that preference. France is very big on freedom and equality. France has been more involved in responding to ISIS on their turf with force. And of course, Muslims never forgot that Charles Martel defeated Islam’s invasion of France in Poitiers in 732. So there is bad blood between France and radical Islam. Terrorism will continue on French soil. It used to be that the highest challenge with terrorism was that nobody knew where or when it would hit next. This was already a tremendous challenge to keep up with. This continues to be the case except that now we can add method to location and timing. In other words, we don’t know where or when terrorism will occur but we also don’t know how. This makes for a very volatile recipe. France is not alone in this predicament. The whole world is a potential victim of Apocalyptic Islam. Europe is obviously struggling with its own migrant crisis, and the Summer months will inevitably usher many more emigrants to the region. Loose borders allow for many migrants to move about freely between European countries, and we have already seen terrorists come out of the migrant human flow, where they hid until the opportune time. They were all Muslims. There is an unavoidable connection between Islam and terrorism and this has nothing to do with racism since Islam isn’t a race but an ideology. Obviously, not all Muslims are terrorists, but so far, all terrorists have been Muslims. Nobody speaks of Christian terrorism, Jewish terrorism, Buddhist terrorism, Hindu terrorism…etc. For reasons that escape me, very few “moderate” Muslims speak up against radical Islam. Is it fear, indifference, allegiance? nobody really knows. In the meantime, Islam continues to push the envelop and France continues to make way for new laws in favor of Islamic culture. I am not against teaching Arabic in French universities but I don’t agree that it needs to be done so early in Middle schoool. Many fear that it will be at the expense of basic French that many students also struggle with. But it goes deeper than just adding one more foreign language. 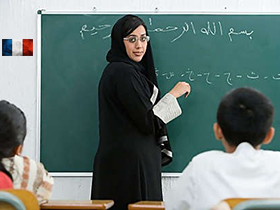 Najat Vallaud-Belkacem also added that if there are no teachers to currently teach Arabic in French schools, she will work hard to bring “outsiders” as she called them. If I lived in France and had my young children in schools, I would be worried about “outsiders” coming to teach Arabic. Especially at a time when France needs reassurance that its citizens are safe. She did mention that all of it will be done by choice from the parents. I believe that this is going to open the door to more Islamic influence in French schools at an earlier age. Jewish kids have already been leaving the French public school system in large numbers. Seeing how Islam has pushed its way into French culture, government and education and has not integrated or assimilated, adding Arabic as an elective in Middle school is not a good idea. It actually looks more like appeasement than anything else. The question is “How long will it remain an elective?” After all, If France has to “learn to live with terrorism”, Arabic might come in handy! Holocaust Memory: What Would Elie Wiesel Do?